On the new content-side, we get two 100-entry tables on ruined buildings – both characteristics and appearance and general dressings and also a total of 20 complications for these buildings and 20 legends surrounding them – now don’t get wrong, these are glorious, but feel like they could have benefited from a Dungeon Dressing-style cheat-sheet of terrain hazards…you know the type one find also in the other Dressing-series by Raging Swan Press. We get the same amount of tables for statues and monuments, btw., though here the dressing-table is much more extensive and covers more than the small entries provided for ruins – instead of e.g. “Smashed in windows”, we get monuments that double as guard posts, some with starnge depressions etc. So in that regard – cooler here! (Also: Monuments don’t require a terrain-hazard cheat-sheet or the like, so no complaints here.) The appearances of Wizard’s Towers are also delightfully extravagant, and as such, the table fits only 50 long entries in the two pages devoted to it. However, 100 different dressing should provide ample modification for these, especially due to the rather eclectic selection provided. And if you’re starved for ideas, 20 hooks and complications and 20 legends, all adhering to this level of lovingly crafted detail, further add to the experience and variety. Now I was not particularly kind to “Random Encounters: Urban” and so, Raging Swan has added additional ones to this book – the first of the new ones being “Fire Sale!”, in which a shopping trip to the alchemist results in a sudden fire and a bid to save the alchemist and keep the shop from blowing up – cool! The second new encounter would be all about a dormant, intelligent sword coming back to sentience when a hapless smith was supposed to modify it. Hilarity ensues. Awesome. An Imp-Oracle of fire and soot makes for an interesting info-broker/pyromaniac and investigating a case of vanishing corpses also makes for a nice diversion. Have I mentioned the dread encounter with the Boogeyman of the Alley, a lethal urban fey that is disturbing indeed? Or the encounter in which the PCs have to brave the unstable scaffolding of a church to make sure it’s properly renovated…and defeat the old gargoyle nesting there? So how to rate this, then? See, this is where it becomes complicated – on the one hand, this book contains pdfs I consider rather subpar, whereas it on the other hand also provides some great new content and often-used classics that have seen ample successful use in our games. 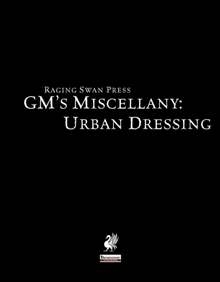 In the end, I consider this book to be exceedingly useful, but also short of the awesomeness that the Wilderness Dressing-book is – DMs looking for a way to make their cities more vivid – get this. My final verdict will clock in at 4.5 stars, rounded down to 4 for the purpose of this platform.